JanTink at SCS (click for template). My co-workers wedding colors are Ivory, Red and Black. I went a little crazy on the SU Dazzling Diamonds. I used the SU Scallop Circle punch for the bouquet holder and then paper pierced holes in each scallop. The flowers are mini primas I had. Over all I am pleased with the card. 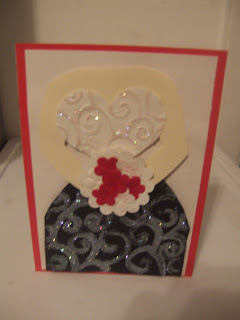 I used the Cuttlebug Divine Swirl embossing folder for the pattern on the dress. The top part of the dress is a heart cut on the cricut machine using the george cartridge. What a fun creative wedding card! Do give it to her... I'm sure she will be pleased! Thanks so much for taking part in our challenge!